I am wondering if I could install the Kali hacking tools on Ubuntu Vivid Vervet. I have seen multiple guides about installing it on 14.04 - 14.10 but none on 15.04. I have already tried installing the debian repositories which I now know breaks your distro. Before posting duplicates please read what version of Ubuntu the PPA was built for eg. Utopic, Raring etc. I need it for Vivid Vervet. katoolin is a script that helps to install Kali Linux tools on your Linux distribution of choice. Those who like to use the penetration testing tools provided by the Kali Linux development team can effectively do that on Ubuntu by using Katoolin. The following instructions are for installing Katoolin on Ubuntu 15.04. These instructions also work on all other currently supported versions of Ubuntu. When you go to View Categories and then enter 0 for all, the installer will immediately return to where you were. Scroll up, and you may see that a number of the packages can't be found. Those packages are no longer maintained or have been removed from the Kali repositories. If this happens the best option is to install Kali linux tools one tool at a time in a series of distinct steps. I doubt you'll find all the Kali tools. As well, it's not just the tools you need. Kali is a purpose built distro. The software in it is selected for the (intended) purposes of ethical hacking and forensics. The kernel has modifications, the software is based on Debian, and most if not all the packages are actually modified in some way from Debian. Ultimately, while you will not likely find all the Kali tools, you may find some, such as Metasploit, but you're missing on some purpose-built security-centric changes that Kali does in addition to Debian and Ubuntu (i.e. it stops services loading at boot, and other things). Kali linux does not use PPA's like the other distros this is part of their security. How ever it is possible to add PPA's to kali and Kali PPA's to other distros. ! ! ! ! ! ! AT YOUR OWN RISK ! ! ! ! ! ! ! ! ! ! ! Please get all of the Kali linux PPA's from the tools listing on the Kali site. They have a updated list of tools with links and PPA's for all of the stuff on their distro's. Not that Wagungs tools are not safe but that being open source any one can make changes to it and I will not tell you or any one to get stuff I myself would not. They may be safe but I advise using Kali to go the the official source of all the individual projects for safety of your system. So you know exactly what your getting is the real deal with untampered code. 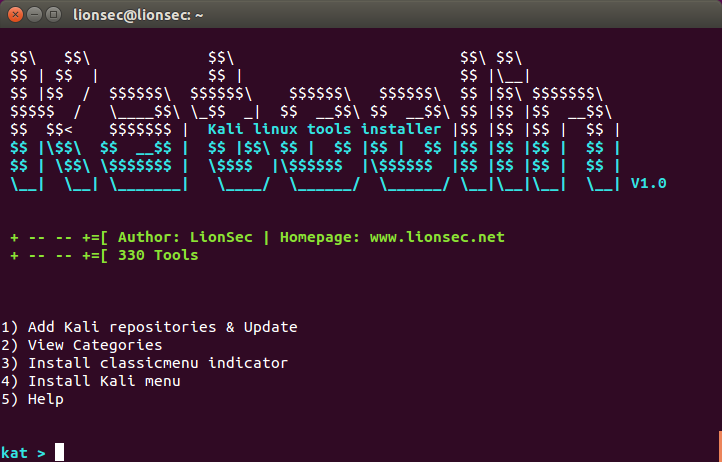 If you would like the install kali tools on Ubuntu or other distros you may run in to binary dependency problems. You can find a list of all the kali linux tools on their site here. They have all of the PPA's and official project links well organized and kept up to date if you wish to install with the PPA's. You can all so read their Documentation on Kali to install their PPA's and tons of other neat stuff. Like most distro PPA databases Kali's is all so kind of hidden so it's easiest to just have a disk to live boot to get all their PPA's or play with their tools. I believe that Kali and Ubuntu have multi-arching compatibility issues. I am running on trusty and I have had some binary compatibility issues with installing some of their tools. So you will need binary, source, library, and PPA's that do not conflict from both to have %100 successful blend. Kali unfortunately is designed not to use PPA's ever except for the install default two or three provided by Kali themselves. This is part of their tight security feature that makes their Distro so secure since it's much harder to be tampered with by viruses and malware and such. You want to make sure that you do not have to many Kali PPA's or to many Ubuntu or Debian or Arch whatever of any kind because mixing PPA's can drag you to your grave. They will essentially start fighting over your system when you sudo apt-get upgrade causing install and removal of various packages, libraries, and etc... This can cause incompatibility issues and conflicts beyond just a simple fix. They can really make things get funky quick. It is ok to do sudo apt-get update with the PPA's but do not upgrade. You will want to comment out the extra PPA's for the tools after updating to you do not screw your system over with upgrade. Most of Kali's tools are going to have to be installed by source code and mixing PPA's and using apt-get upgrade can delete necessary things for Kali tools or Ubuntu to work. It is most import and I have to stress that Debian PPA's (Kali's Deb based) do not really get along with Ubuntu PPA's. Though every one is technically Debian based. They should be thought of more like In laws. There family but not really tolerable but you can get along. Not the answer you're looking for? Browse other questions tagged kali-linux-tools or ask your own question. How can I install Kali tools in Ubuntu 14.04? How do I install asleap tool in Ubuntu?